Are you an entrepreneur? Are you looking for funding? Would you like to make your small business grow? 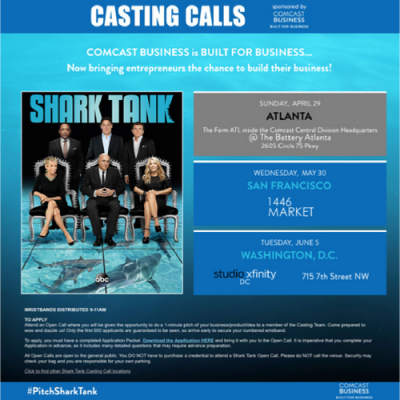 Attend the Shark Tank Casting Call on May 30 in San Francisco and gain the opportunity to pitch your business idea to renowned investors on national TV! Attend an Open Call where you will be given the opportunity to do a 1-minute pitch of your business/product/idea to a member of the Casting Team. Come prepared to wow and dazzle us! Only the first 500 applicants are guaranteed to be seen, so arrive early to secure your numbered wristband. To apply, you must have a completed Application Packet. Download the Application HERE and bring it with you to the Open Call. It is imperative that you complete your Application in advance, as it includes many detailed questions that may require advance preparation. All Open Calls are open to the general public. You DO NOT have to purchase a credential to attend a Shark Tank Open Call. Please do NOT call the venue. Security may check your bag and you are responsible for your own parking.